Annexe to Aphrodite’s Hotel, 30 second stroll to main building. We are easily found and in a prominent position, any problems please ring reception and we will guide you to us. 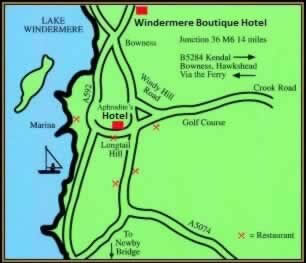 The Windermere Boutique Spa Suites is in a near perfect position situated in a quiet area just a few minutes walk down to the shores of Lake Windermere or alternatively to the Marina where you can sit in an idyllic position viewing the lake and boats from the comfort of the Spinnaker Bistro. 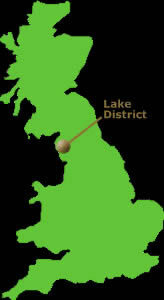 From here you are only a few minutes stroll to Bowness Bay and village, deemed the very heart of the Lake District with it the excellent choice of steamers and various pleasure craft, trendy bars, real ale pubs and a huge variety of restaurants including fine dining, a theatre and 3 cinemas. Alternatively within a few minutes walk from the grounds of Windermere Boutique Spa Suites there are a choice of 4 restaurants some of which have proven popular with regular clients.